The third quarter earnings period starts up in early October, and if September is any guide, it’s going to be a long earnings season for investors. Over the last two weeks, 54 companies have reported earnings (the number of companies that report during the “off season” is much lower), and their stocks have averaged a one-day decline of 3.2% on their earnings reaction days. That’s an absolutely brutal reading, and while it’s a small sample size, it suggests that investors are not liking what they’re seeing from corporate America. 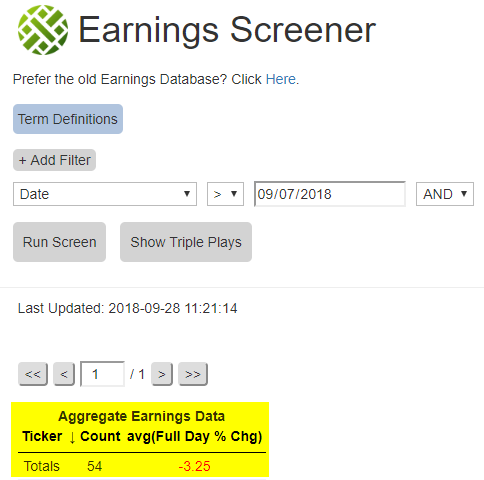 Below is a snapshot from our Earnings Screener, which allows users to pull up earnings stats like the one mentioned above. It’s available at the Bespoke Institutional level, which you can access with a two-week free trial. 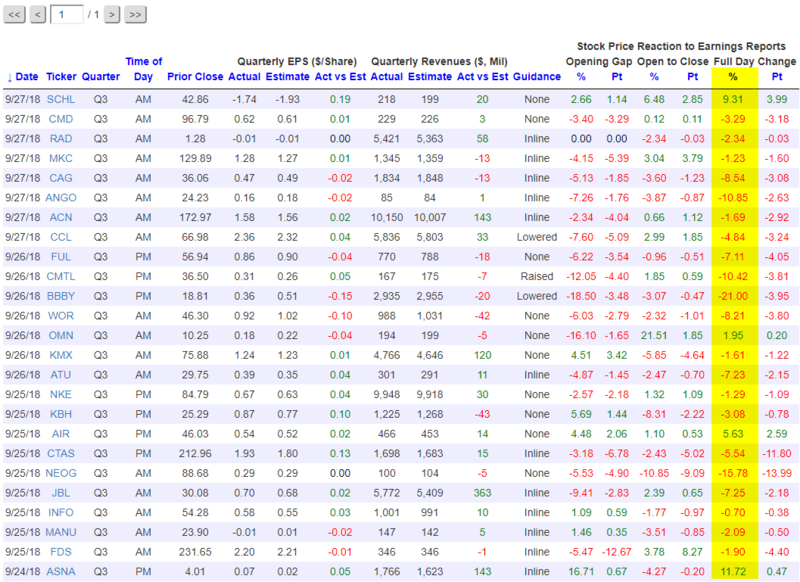 Below is a snapshot pulled from our Earnings Screener showing the stocks that reported earnings just this week. We’ve highlighted each stock’s one-day price change in reaction to the earnings news. As you can see, there’s a lot of red! In fact, the average one-day change for the stocks that reported this week was a decline of 3.6%, and only 4 of the 25 stocks that reported ended up gaining on their earnings reaction days.